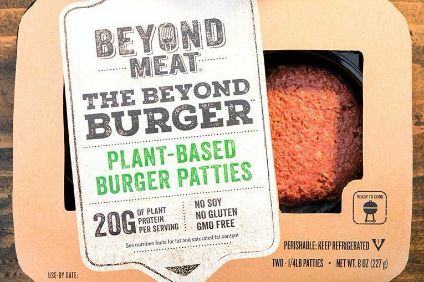 US-based plant protein start-up Beyond Meat plans to expand worldwide this summer through agreements with distributors and foodservice outlets. Founded in 2009, Los Angeles, California-based Beyond Meat said in a statement yesterday (8 May) 50 countries are on its target list in the ''coming months'', including Germany and the rest of Europe, Canada, Australia, Mexico, Chile, Israel, UAE, South Korea, Taiwan and South Africa. The privately-owned company launched the Beyond Burger in 2016 and said it has now sold more than 13 million of the protein patties, which are made from plant derived ingredients and are free from soy, gluten and GMOs. Beyond Meat took those burgers into Hong Kong last year. Founder and chief executive Ethan Brown said of the overseas expansion: "These additions make it possible for us to support international launches, building upon the successful 2017 introduction of the Beyond Burger in Hong Kong. The company has found extensive success in the U.S. market, doubling sales in 2017 and increasing distribution of its portfolio to more than 27,000 grocery stores and restaurants. "Reflecting rapid demand growth in the United States and sustained interest from international markets, we've taken steps to significantly increase our production capacity." Beyond Meat counts Bill Gates, Leonardo DiCaprio and US meat giant Tyson Foods among its investors.